OPERA DIABOLICUS is the brainchild of composer David Grimoire and lyricist Adrian de Crow. The idea sprung to life when the two of them met randomly at a stage play of Umberto Eco's book The Name of the Rose at a theatre in Gothenburg the year 2006. Both of them were very intrigued by the story and they ended up talking about how interesting it would be to make a theatrical and dark metal musical based on that kind of a story. The conversation between them that took place in Gothenburg that bleak December night planted the seed that soon should grow to be the concept of OPERA DIABOLICUS. For this project an impressive group of musicians has been gathered together. As well as David Grimoire and Adrian de Crow, the lineup includes the multi-talented singer/musician, Snowy Shaw (Therion, King Diamond, Notre Dame, Dream Evil, Dimmu Borgir and more), Jake E. (Amaranthe), Mats Leven (Krux, Yngwie Malmsteen) and Elias Holmlid (Dragonland). With that much talent gathered together then expectations are bound to be high. Happily the results are great. The music has an epic quality similar to that from Therion, and like Therion mixes different styles into the music. 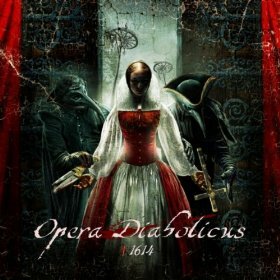 There are very few bands that can make music with this sense of theatricality - Trans Siberian Orchestra and Therion being two of the prime examples, and now Opera Diabolicus. The music is dark, dramatic, eerie at times, with powerful heavy metal guitar work at times, and subtle delicate guitar work at others. For me the way they have blended powerful doom laden heavy sections with more symphonic elements is fantastic - it all works perfectly. This is a superb album - a dark moody metal musical. Buy it ! The album is out now on Metalville records. Vocals: Snowy Shaw, Mats Leven, Camilla Alisander-Ason, Jake E, Nick Night.